When I first moved to the previous Cold House, the cellar was the warmest place in the house in winter. The cellar steam pipes were uninsulated, and did a better job of heating the cellar than getting steam to the upstairs radiators. I shudder to think of the oil I burned that first winter (and that the previous owners must have been burning before me)– sheer insanity. Even after I insulated those pipes, the incidental heat from furnace and pipes kept the cellar pretty warm. At the New Cold House, though, I thought it quite possible that the cellar would dip down below 32º and threaten the plumbing. Other than our (hyper-insulated) hot water tank, and the occasional lurking cat, there is nothing at all adding even incidental heat into the cellar. With uninsulated concrete walls, some crummy old windows, a frequently-opening cat door, and a barely-heated upstairs above, it seemed there wouldn’t be much to keep the cellar from equilibrating to outdoor temps. As you may remember, early in the winter I took pains to monitor the temps down there, especially around the plumbing. But you know what? Even even when it’s sub-zero outside, the cellar hasn’t dipped below 37º. At first I thought it was just the thermal mass of all that concrete cooling very very slowly that seemed to magically hold the temperature. But when day after day of below-freezing outdoor temps failed to budge the cellar thermometer, that started to seem less likely. So no matter how cold the top parts of the foundation wall get, the bottom two feet of it– and the whole floor– are always at least going to be above freezing. 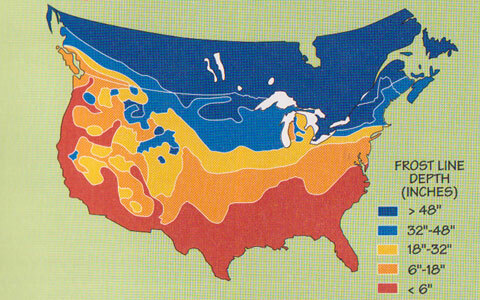 A little research reveals that, generally, once you dig down 6 feet or more under ground, the temperature is almost stable year-round, and tends to settle at an approximation of the year-round average outdoor temperature for a particular location. Now, our year-round average temperature here in Portland, Maine is 46ºF. As an experiment, I took the remote sensor from my digital thermometer, put it in a plastic bag, and dropped it a foot or so down into the sump-pump hole in the basement floor. I replaced the plywood lid, put some fiberglass mat insulation on top, and waited a few hours. Result: the temp down there is an even 44º. 3º warmer, at the moment, than the air at head level in the cellar. So the moral of the story is that the cellar seems to be acting as its own passive geothermal “furnace”. When the upper parts of it get below 44º, they start pulling warmth from the lower parts, which in turn are warmed by the massive heat stored in the ground itself. This is pretty cool, I think. Yes, I could insulate the top two feet of the cellar walls– which might keep the whole basement a few degrees closer to 44º in the coldest of weeks– but it hardly seems worth the trouble. This entry was posted on January 24, 2010 at 3:04 pm and is filed under Hard data, Uncategorized. You can follow any responses to this entry through the RSS 2.0 feed. You can leave a response, or trackback from your own site. I’m new here today (especially interested in strategies but haven’t yet explored that much) so this may have been addressed already but there may be a corresponding effect which could be utilized at the opposite point of a coldhouse: a roof absorbing radiant heat from the sun will tend to heat the air within an attic. If you open your pull-down stairs a bit when you go to work, the coldest of that warmed air will fall into your home and warm it of course remember to close it after the sun becomes ineffective. I don’t have any hard data but know that I have spent some comfortable time up in my “garrett” doing my taxes on a cold (sunny) Winter day. I have a cabin, the basement is on a slope so a little over half is under ground. We are only there part time and it gets very cold, last week it was -17 up there for a few nights, but the basement stayed above freezing. I have the walls and ceiling/floor between the living area and the basement insulated so I can keep water in my cistern down there year round and just have to drain the lines upstairs when we leave and add biodegradable RV antifreeze to the P-traps and the toilet. This is the first year we’ve had the cabin done so I’m very happy with the results so far. Nice! Wow, -17– is that F or C? Though they’re pretty close at that point! Where is this cabin– Alaska? Siberia? We haven’t had anything close to below zero here in Maine this year– barely anything close to freezing, really. Strange.